Sphaerexochus brittanicus, from Museum Victoria. 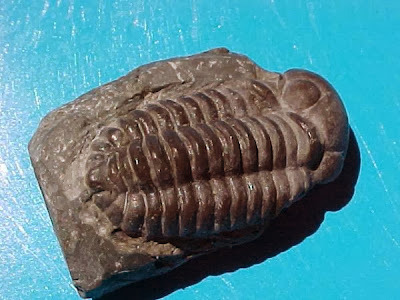 The fossil in the image above belongs to a genus of trilobites that lived from the Mid-Ordovician to the end of the Silurian. Distinguishing characters of Sphaerexochus include the massive inflation of the glabella, the central section of the trilobite head, which became almost spherical. The cheeks on either side of the glabella, in contrast, remained fairly small. The inflated glabella was marked on each side in the posterior part by a deep furrow that run in a curve from the side to the posterior margin. In the photo above, this furrow marks out the circular section that looks a bit like a large eye; the actual eye can just be made out in the photo (I think) as a crescent-shaped structure on the cheek below the glabella. The rear outer corners of the cheeks were more or less blunt in adult individuals, generally lacking the prominent cheek-spines of many other trilobites (small spines were present in juveniles). The spines on the trilobite's rear end (the pygidium) were also blunt and stout. Přibyl et al. (1985) recognised four subgenera within Sphaerexochus, and this classification was largely supported by Congreve & Lieberman (2011) in a phylogenetic analysis (one of the subgenera, Onukia, is not known from well-preserved material and hence could not be analysed by Congreve & Lieberman). One of the subgenera, Korolevium, retained short cheek-spines as adults; they were absent in other subgenera. 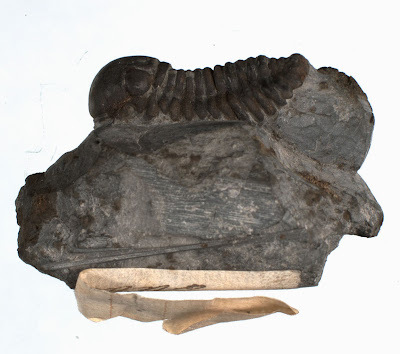 The remaining two subgenera, Sphaerexochus and Parvixochus, were distinguished by features of the hypostome, a plate on the underside of the head that covered the mouth in life. Korolevium and Parvixochus were both extinct by the end of the Middle Ordovician, but the Sphaerexochus subgenus sailed on and passed through the mass extinction event at the end of the Ordovician apparently unscathed (Congreve & Lieberman 2011). Another view of Sphaerexochus brittanicus, from the Carnegie Institution. Sphaerexochus was restricted to warmer waters in the Palaeozoic ocean (fortunately for Sphaerexochus, during the Silurian this was just about everywhere). Fortey & Owens (1999) interpreted its large glabellar furrows as providing an attachment site for the muscles of a correspondingly well-developed pair of limbs. Features of the hypostome indicate that Sphaerexochus had a relatively large oral cavity, and the combination of large anterior limbs and a big mouth lead Fortey & Owens to suggest that it may have been a raptorial predator. Přibyl et al. (1985) noted that Sphaerexochus specimens have often been found with the main body and head bent at an angle from each other, and suggested that they may have spent a lot of time with the body buried in the sediment with only the head above the surface. These observations add together to suggest Sphaerexochus living as an ambush predator, lurking in wait whilst largely hidden in the sand for any smaller animal unwary enough to get too close. Congreve, C. R., & B. S. Lieberman. 2011. Phylogenetic and biogeographic analysis of sphaerexochine trilobites. PLoS ONE 6(6): e21304. doi:10.1371/journal.pone.0021304. Fortey, R. A., & R. M. Owens. 1999. Feeding habits in trilobites. Palaeontology 42 (3): 429-465.